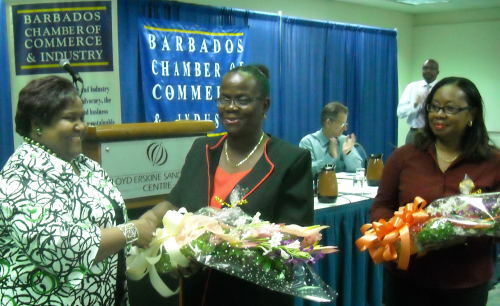 Barbados Chamber of Commerce & Industry Honours Two Staff With 30 Years’ Service! In 1978 the calypsonian Mighty Destroyer was Pic O’De Crop Monarch with his “I Man Bitter,” the late Rt. Hon. JMGM “Tom” Adams was in his second year as Barbados’ second Prime Minister after Independence and the Chamber of Commerce (as it was known then) was situated at Norman Centre in Bridgetown. Carol Charles started in February 1979 as Secretary to the General Manager and moved on to Administrative Assistant before settling in as the Chamber’s Business Development Officer. Eudene Wright, now Senior Accounting Officer, got her break in 1978 through Recording Secretary Monica Young, when Mrs Young asked Eudene to commence as a Clerk/Typist. Soon, Eudene became more valuable to the Chamber as she learned her duties quickly, and sought to add to her capabilities, she went from Stenographer to Secretary to Senior Administrative Officer with responsibility for bookkeeping to her current post. Between the two of them, they have seen 15 Presidents and eight Executive Directors in their history at the Chamber. President Glenda Medford and the Council of the Chamber recently paid tribute to the two ladies at the 183rd AGM of the Chamber. Both Eudene and Carol received crystal and elegant timepieces as part of the recognition for their valorous service and dedication over the decades. The ladies were shocked and pleasantly surprised at the kind gesture. They vow to continue being a part of the BCCI as long as health and fate allows. Established in 1825, the Chamber is one of Barbados’ oldest Non-Governmental Organisations with current membership standing at two hundred and fifty businesses. It’s the focal point for companies and businesses to network for improving cooperation and linkages with each other and is concerned with developing all aspects of the island’s trade and industry. The Chamber represents employers with a total staff complement of over 18,000.